The news about Japan’s damaged Fukushima Daiichi nuclear power plant just get worse and worse. The authorities waited until nearly 3 months after the monster tsunami (that was triggered by the March 11 earthquake) had damaged the coastal plant to finally tell the truth. Not one (as previously said), but all three of the plant’s damaged reactors had experienced a meltdown. The latest bad news: Citizens groups claim that soil some 40 miles from the plant has radiation levels above those of Chernobyl. Agence France Presse reports from Tokyo, July 5, 2011, that six citizens groups or NGOs (non-governmental organizations (including the Fukushima Network for Saving Children from Radiation) asked a radiation expert, Kobe University professor Tomoya Yamauchi, to do a survey of soil samples. Yamauchi tested the soil from four locations in Fukushima — a city of 290,000 people, which is 40 miles from the stricken nuclear plant and is outside the government-declared evacuation zone. The citizens’ groups have called for the evacuation of pregnant women and children from the town. This entry was posted in Children, Natural disasters. Bookmark the permalink. I also heard that they will be ‘stress testing’ other reactors. 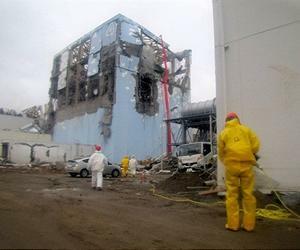 Having lowballed the outcome of the tsunami, and the damage it caused to the reactor, plus the damage caused by bad design, does anyone think they’ll give the whole truth of what is discovered? If you answer yes to the question above, please turn in your diplomas. Or, at least demand a refund for the tuition you paid.